HomeExpat Living In ThailandThe Avenue Pattaya – more retail closures in central Pattaya ! The Avenue Pattaya – more retail closures in central Pattaya ! The avenue Pattaya Just went into the mall next to villa market all the retail outlets are closed , the glass has been removed & the only thing left on that side if the shopping mall is the passport office.Other businesses remain open locals blame high retail rental prices in downtown Pattaya.The location of the avenue Pattaya is in central Pattaya close to beach road and the soi 13 area.The closure only effects the previous franchised area not the main area of the mall. This does not effect the following businesses who continue to trade succesfully. various food retail outlets in the comlex. With other retail developments close by such as central tourists & locals seem to head there as they have better facilities. 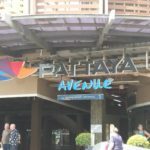 Whats next for the Avenue Mall Pattaya – possible entertainment complex? Lots of rumours regarding this the most popular being a bar complex similar to Nana in Bangkok, I cannot see this myself but lets see what the future holds. Ramyana water park Pattaya – review of whats on offer !